This tutorial will help you to set-up a mailing list. 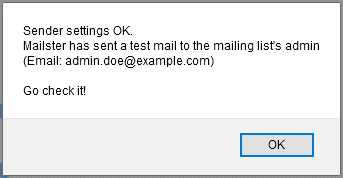 sending a test message to the mailing list. 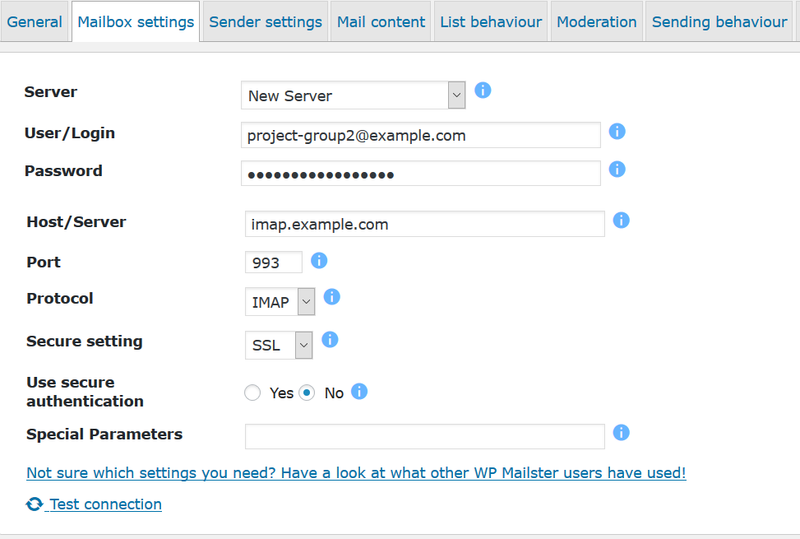 If you don’t have installed WP Mailster yet, have a look at the installation tutorial for the system requirements and the quickest way to install WP Mailster. In this section you will provide some basic data of your new mailing list. 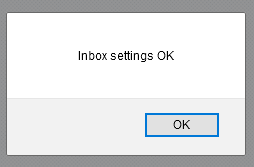 After that click on the next tab (Mailbox settings). 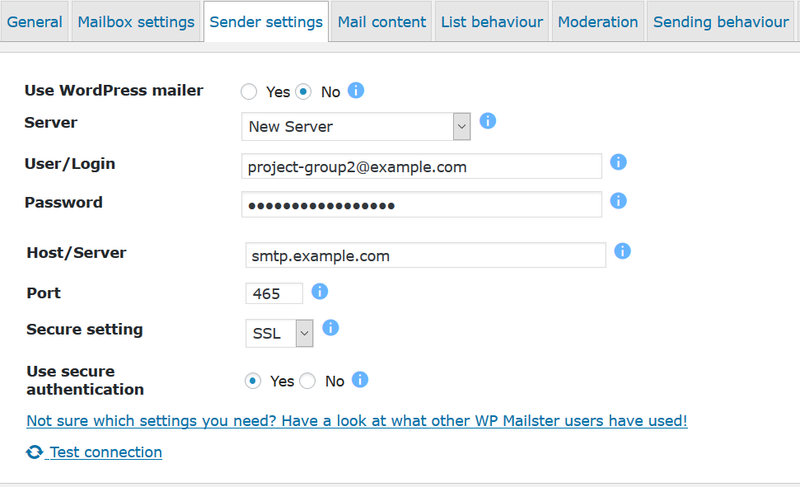 WP Mailster uses a normal email mailbox that can be accessed with IMAP or POP3. You can either choose one of the readily available settings or, what we recommend in most cases, use your own email provider (e.g. of the domain hosting you are using). Choose “New Server” in the Server dropdown menu. You will see input fields to enter the server login information. The settings in this section are crucial for a working mailing list. Ask your mail provider (of the mailing list email you provided in the last section) for the needed details or have a look at the settings of popular providers. Click on ‘Test connection‘ to make sure your settings are correct. Please use a dedicated mailbox for WP Mailster. Any emails in it will be treated as mailing list emails and therefore send out to the recipients. Thus, do not use your personal email accounts, create/use a different email account. After that click on the next tab (Sender settings). You have two choices here: the easy way is to use your normal mailbox sender (the one WordPress uses). The other way (which is recommended) is only a little more difficult: using an SMTP server. First, choose “New Server” in the Server dropdown menu. At this point you have the basic setup for a working mailing list. Of course, there are further tabs with settings helping you to customize and finetune your mailing list. Those settings are covered seperately and can found (under the respective settings title) in the tutorial section. After that click on Add mailing list to save your settings. If you did all settings you will get the message that your new mailing list was saved and will be back at list where you can manage all your mailing lists. Now we are ready to add recipients to our mailing list. 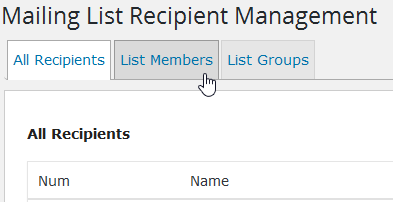 The tab ‘All recipients’ gives an overview of all recipient names and email addresses – well, not too much until now. You can add every WordPress user as a recipient. Don’t worry if not all recipients belong to your WordPress users – you can store them under the user section and add them later. 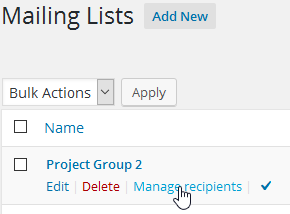 A feature that you might find useful if you want to manage several mailing lists are user groups that you can add to the recipients. Example: you have a group ‘Designers’ that is enrolled in the mailing lists ‘Support’ and ‘Development’. Whenever the designer department has a new co-worker or intern their email addresses have only to be added in the group ‘Designers’ not in every mailing list. In our case we would send an email to project-group2@example.com. You can send it any way you like – use your favorite email client (Outlook, Thunderbird, GMail, …). Now it is time for testing the list and, if needed, to adapt the other mailing list settings.